More than 50 African presidents and prime ministers are arriving in Washington, D.C., for the US-Africa summit. This fanfare moment in President Obama's African strategy comes at a time when issues on the continent are high on the news agenda. Guinea, Liberia and Sierra Leone are in crisis with the deadly Ebola virus spreading quickly across the West African region. Last week an Air Algerie plane crashed over Mali, killing all 118 passengers and crew, and the new nation of South Sudan remains ravaged by conflict. While undoubtedly these issues will be part of discussions in our nations' capital, leaders will also be discussing how to tackle the continent's hidden crisis -- hunger. The UN's World Food Programme estimates that 24.8 percent of the people living in sub-Saharan Africa go hungry every day -- and that's only part of this massive continent. It's not the first time that the leaders are having this conversation. This summit comes hot on the heels of an African Union Summit at which heads of state committed to ending hunger in Africa by 2025 and spend at least 10 percent of their budgets on agriculture. But this summit in D.C. promises something slightly different. Big agribusinesses will be present in large numbers -- with the administration believing this group to have a vital role to play in reinvigorating the African agricultural sector. But this is where President Obama and his advisers have got it wrong -- the future of Africa should not be sold to the highest bidder. A little while ago, I met Zilpah, a woman farmer from Rwanda. Straightaway you could tell this woman was a force to be reckoned with. She exuded an attitude and energy that told you she was used to getting things done -- and she didn't disappoint. Zilpah isn't just a farmer, she's also the president of a powerful women's cooperative in her community. Her ambitions aren't limited to farming and running her cooperative. She's a woman on a mission! The Tuzamure Agaseke farmers' cooperative in Karongi, Rwanda is primarily made up of widows who lost their husbands in the Rwandan genocide. 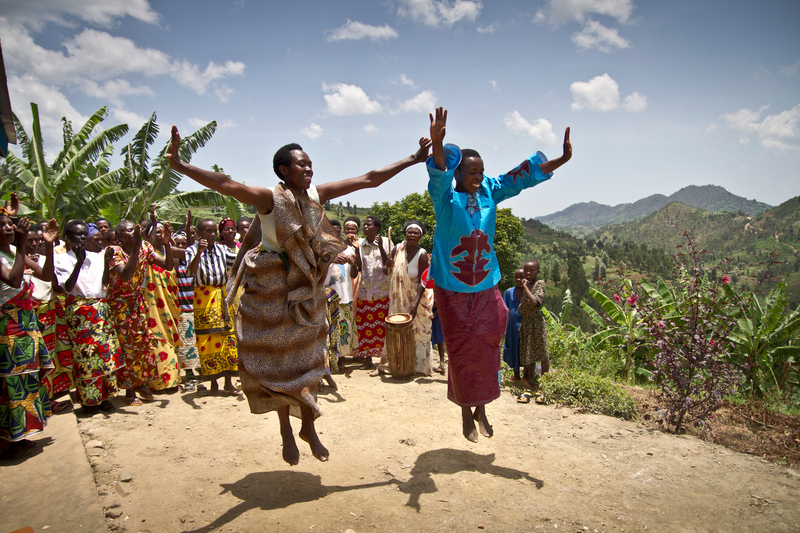 Both sides -- Hutu and Tutsi -- are coming together to build a better future for themselves and their families. Led by Zilpah, the women have started a basket weaving business, building a school for their children, and they've bought a corn mill to make corn flour for local markets -- a huge achievement! Now she's determined to tackle some of the biggest challenges that women farmers across Africa are facing. Women smallholder farmers tend to receive little support from their governments in Africa. Unlike farmers in the U.S., they don't have access to relevant agricultural research, credit, or secure land tenure, to name just a few. Despite the fact that between 60 and 80 percent of all the farmers in Africa are women smallholders, they are too often ignored by both their own governments and donors alike. But if this wasn't difficult enough, in addition to decades of underinvestment from governments, farmers like Zilpah now face a new threat: They are at risk of losing their land to the large agribusinesses that are rapidly expanding into Africa. In 2012 President Obama launched a new initiative called the "New Alliance" in the run up to the Camp David G8. This alliance is between donor governments, African governments and agribusinesses and is meant to help poor farmers. The reality, however, is that investment from agribusiness is often detrimental to smallholder farmers. Agribusinesses often require large tracts of land to implement their industrial farming model. This often threatens the smallholder farmers who don't have secure tenure and, in the worst case scenarios, can result in smallholders having their land grabbed from them. New Alliance agribusinesses primarily specialize in machinery, seeds and chemicals which are not usually what the smaller farms need. In order to take on these challenges Zilpah is working in partnership with ActionAid and women leaders across Rwanda to take her demands directly to the Rwandan Government. She has been trained in how to understand and track government spending in agriculture and she is using this new knowledge to advocate for a better budget that meets her needs. She hopes that the voice of women smallholder farmers will be heard by her government, as well as other African governments and donors, so her and her fellow farmers can finally get access to the resources they need to make their farms flourish. ActionAid has been working with women farmers like Zilpah across Africa for many years. Today we've released a new report that looks at what these farmers need to be able to increase production and fight hunger. As an influential donor and policy-maker, the White House needs to make sure that the policies it promotes don't do more harm than good. Rather than promoting agribusiness, the US needs to support African governments in their goal of ending hunger. Together they should commit to investing in smallholder agriculture in a way that transforms the lives of smallholder farmers like Zilpah across the continent.